Monster Press is a screen printing company based in Somerset, UK. We’ve been around since 2008, so 10 years at the time of writing. We specialise in high quality screen printing on textiles (mainly t-shirts & other apparel). We have invested a lot of resources in cutting-edge equipment & have developed a great reputation within the industry for high quality, award winning screen prints. We predominantly print for fashion brands & design / quality conscious small to medium sized businesses. Provide a positive & memorable customer experience by building good relationships with clients. Handling customers orders from quoting through to proofing & after sales support. Recommending suitable products & printing methods. Shipping printed & plain sample orders. Good organisation & time management skills. Works well in a small office environment. Experience working in a similar role is beneficial, or any transferable skills that are relevant. An interest in the screen printing industry is beneficial. Familiarity with Adobe Photoshop is beneficial. Familiarity with Macintosh computers is beneficial. £17680K to £20000 starting salary (depending on experience). Quarterly “all expenses paid” meal & drinks with the team. Experience: Sewing experience is required, knowledge of an industrial sewing machine is beneficial. Hours: 40 hours per week but can be flexible. Last month we attended FESPA 2017 (The Federation of European Screen Printers Associations) in Hamburg. This is the largest screen & digital trade show in Europe, arguably the globe. Each year they hold "The FESPA Awards" & this year we decided to enter, to see if we could snag ourselves an award. After hundreds of submissions in our category, we were told back in March that we were shortlisted for an award. We were invited to attend the Gala Night, & after a delicious meal & much booze, the award ceremony was underway. 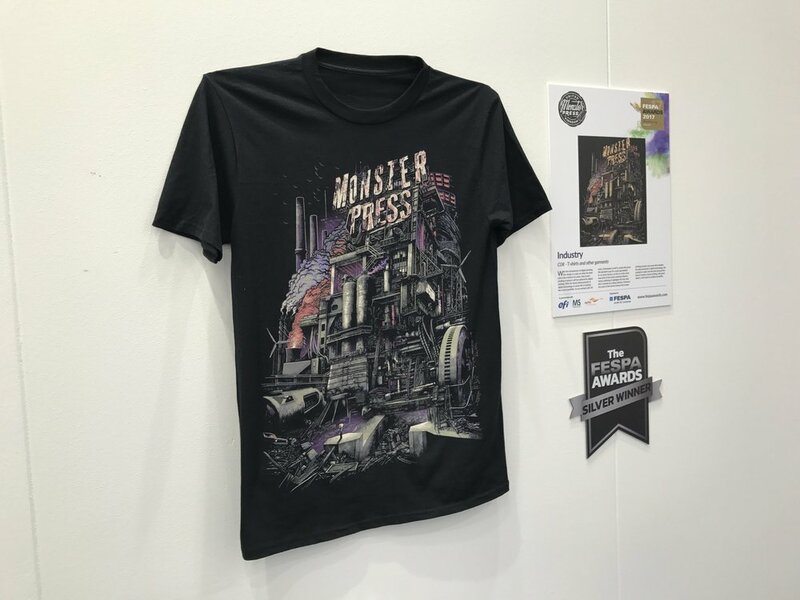 After many sign & digital related awards our category "t-shirts & other garments" came up, & to our surprise & delight, we won SILVER! We're incredibly stoked & would like thank Chris Lovell for the awesome artwork & our customers for their continued support, without you guys we wouldn't be able to keep progressing. We'll be shooting for gold next time around! Due to disruption of services during the Christmas holidays, we're closed from the 24th of December - 3rd of January (& it's always good to have time off to recuperate after a busy year!). Any new orders won't be produced until after this period. Although we will supply a due date including the closure period, please bare this in mind when ordering. We'd like to wish all our customers a merry Christmas, & thank you for putting your trust in us in 2016. We look forward to working with you in the New Year!